pared dienophile. The reaction takes place without using solvent, catalysts, or elimination of any compound. 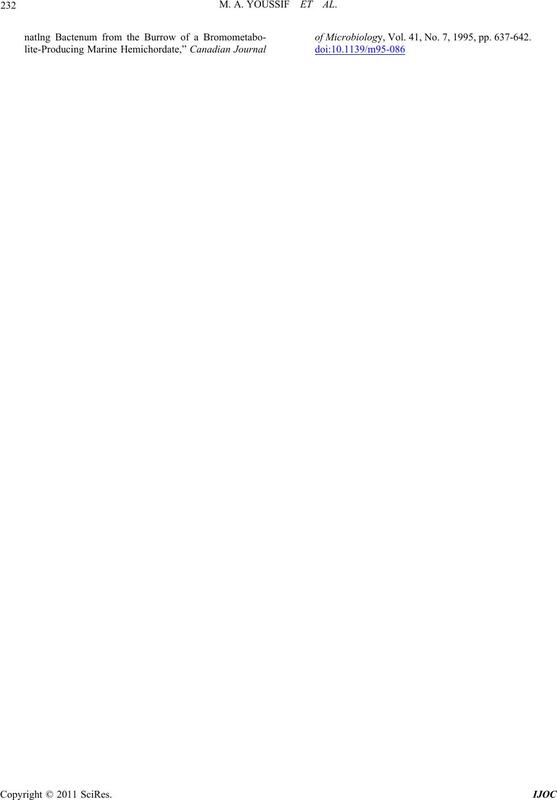 D-A reaction 1,4 cyclo-addition with (HCP) [9,11-15]. M. A. YOUSSIF ET AL. they might be a risk to human health and environment. dissolution of the metal under anaerobic conditions . Density 1.84 g·mL−1, M.p. 64˚C - 68˚C, B.p. 235˚C - 236˚C. 1.398 g·mL−1, M.p. –119˚C, B.p. 71˚C. 2.29 g·mL−1, M.p. 891˚C, B.p. decomposes. M.p. 95˚C, B.p. 56˚C - 57˚C. viscosity at 35˚C, 5.04 Cp and 1.5626.
transmittance % from 30 - 100. Research Institute (EPRI) using Instrument: 6890 plus G.
(NaOH 10%), and then dried over anhydrous MgSO4. d25 = 0.9432. The infrared spectrum is given in Figure 1.
and CH-Aromatic sym. at 3078. Figure 1. I. R. of the prepared ether. Figure 2. I. R. of the new chlorinated adduct. Figure 3. HNMR of the new chlorinated adduct. Table 1. Elemental analysis of adduct. (140˚C), and fixed molar ratio diene:dienophile (3:1). 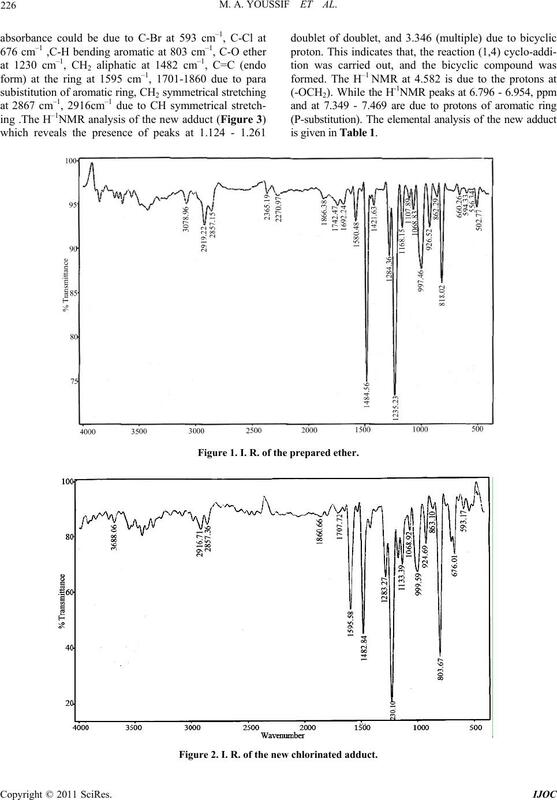 The results are shown in Tables 2-4, and Figures 4-6.
ditions at which the maximum yield could be obtained. The results are given Tables 2-4, Figures 4-6.
ture for this activetion seems to be 140˚C. enophile 3:1, Duration time 6 hours). rium is reached between the main and the back reaction. that take place at one step only, as in chain reaction. tion of undesirable by product [9,13,14,26]. between the main and the back reaction. tion of resin. This is in concordance with [9,13,14,26]. ble bonds, leading to a decrease in the reactivity of diene. dium, in the form of a higher initial molar ratio of diene. quently on the product yield. tly by resonance to the terminal alkenyl double bond. yield in the previous study is higher than the present one. concordance with that mentioned in ref [9,13]. 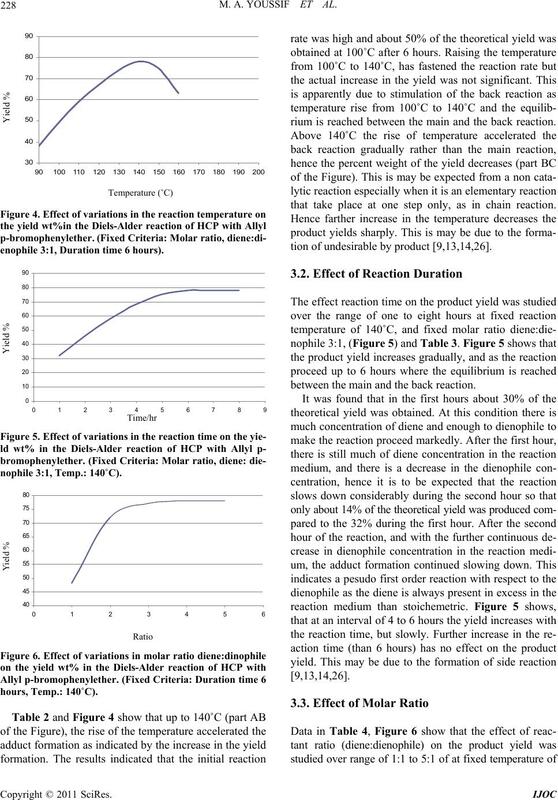 tions (LC) was detected, the results are shown in Table 5.
potent uncouplers of oxidative phosphorylation [31,32]. the metabolic pathway within the cytoplasm. and reaction time 1to 8 hours. 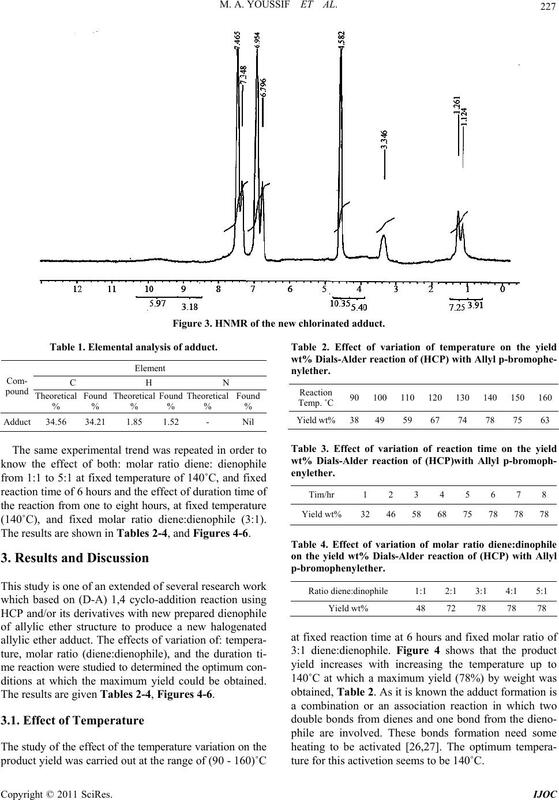 molecular weight, H1 NMR and IR spectra. • Maximum adduct yield was = 78%. Brazilian Chemical Society, Vol. 12, No. 5, 2001, pp. 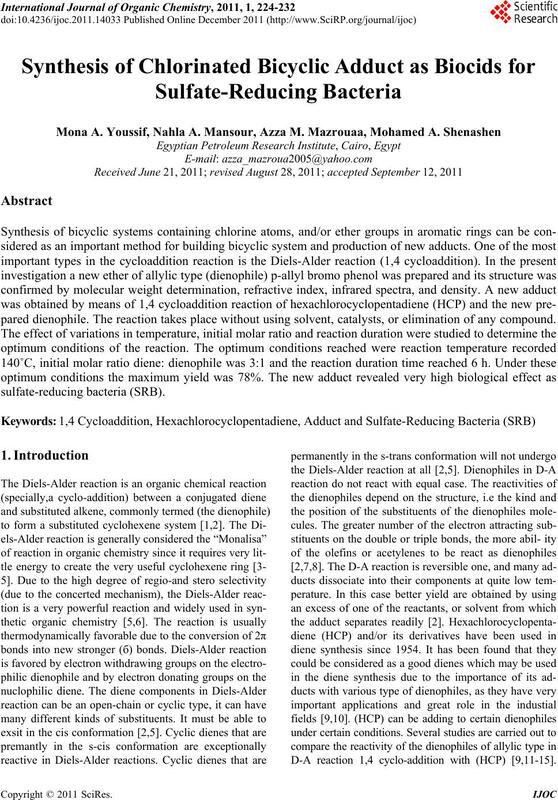 Alder Reaction,” Chemical Reviews, Vol. 92, 1992, pp. 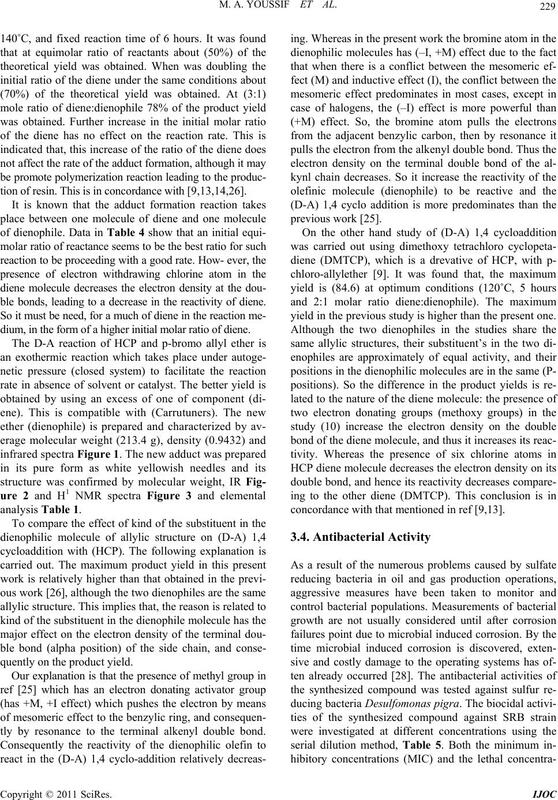 thesis,” Angewandte Chemie International Edition, Vol. 41, No. 10, 2002, pp. 1668-1698.
ses,” Coll , Vol. 10, 2004, p. 442. Molecules, Vol. 7, 2002, pp. 456-465. Sons, New York, 1977, pp. 5-51. Ph.D. Thesis, Pub Azu Pet Institution, Buku, 1983.
leum, Vol. 1, 1992, pp. 35-40. Applied Polymer Science, Vol. 65, No. 1, 1997, pp. 27-35. No. 2, 2007, pp. 1-14. No. 2, 2007, pp. 15-28. Vol. 13, No. 2, 2004, pp. 23-29.
and Food Chemistry, Vol. 4, 1980, pp. 51-54. Biotechnology, Vol. 68, No. 2, 2005, pp. 272-282.
gineering, Vol. 74, No. 5, 2001, pp. 424-434. Vol. 62, 1996, pp. 2999-3004.
technology, Vol. 29, No. 6, 2002, pp. 354-360.
ing,” Corrosion, Vol. 25, 2002, pp. 1-10. Vol. 49, No. 3, 2007, pp. 1097-1109. Aminoantipyrine,” Hauxue Shiji, Vol. 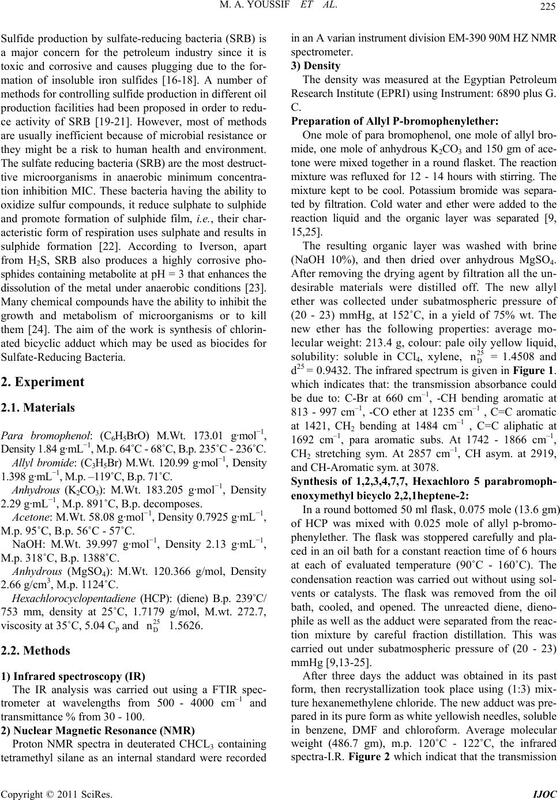 24, 2002, p. 117.
of Science Zagazig University, 1991, pp. 98-109. Pub Azu Pet Institution, Buku, 1982. Corrosion Congress, Granada, September 2002. “Arkivoc,” Vol. vi, 2009, pp. 89-102. Environmental Microbiology, Vol. 54, No. 12, 1988, pp. 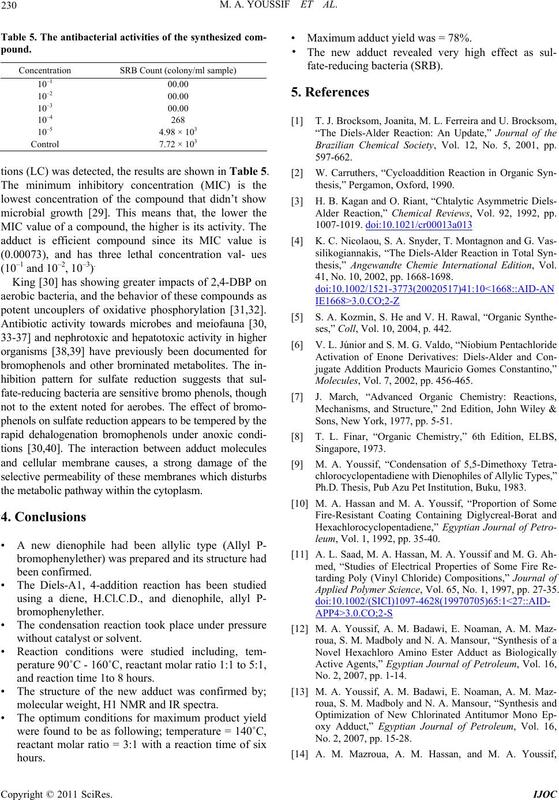 Mtochondria,” European Journal of Biochemistry, Vol. 21, No. 3, 1971, pp. 416-423.
nal of Biochemistry, Vol. 21, No. 4, 1971, pp. 565-574.
dian Academy of Sciences, Vol. 87B, 1978, pp. 145-149. Nature, Vol. 323, 1986, pp. 257-259. S. J. Weiss, S. T. Test, C. M. Eckmann, D. Roos and S.
phenols,” Drug Metabolism and Disposition, Vol. 16, No. Physiology, Vol. 93, No. 1, 1989, pp. 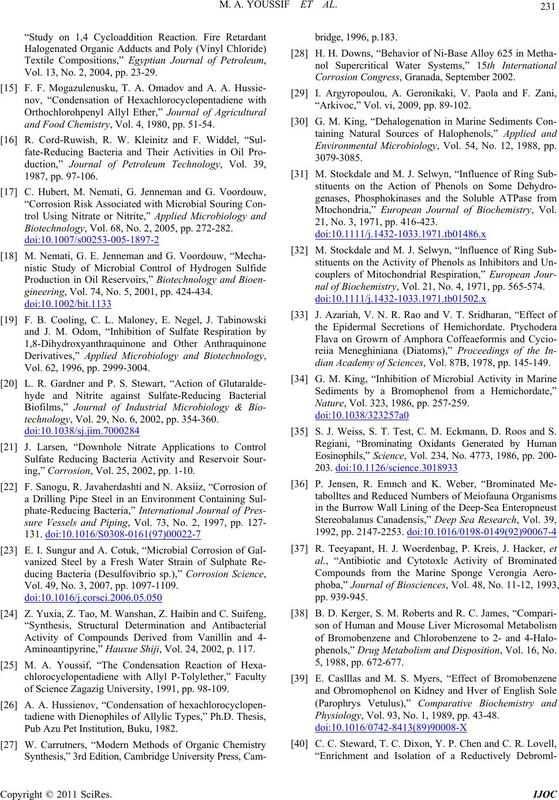 43-48.
lite-Producing Marine Hemichordate,” Canadian Journal of Microbiology, Vol. 41, No. 7, 1995, pp. 637-642.